Notes: Descended from Sir Hercules de Tyrwhitt, living 1067...The last male heir in the direct line, Francis Tyrwhitt, Esq., of Kettelby, d. in 1673, leaving as only daughter and heir, Catherine, wife of Sir Henry Hunloke, Baronet. The Tyrwhitts, of Cameringham, co. Lincoln, descended from Marmaduke, fourth son of Sir William Tyrwhitt of Kettelby, Sheriff co. Lincoln, 28 Henry VIII, were represented by Sir Thomas Tyrwhitt, Lord Warden of the Stannaries, and Gentleman Usher of the Black Rod, who d. 1833. Sir Thomas's uncle, John Tyrwhitt, Esq., of Netherclay House, co. Somerset, Capt. R.N., d. 1812, leaving three sons: 1) Thomas, who took the name of Jones, and was created a Baronet in 1808; 2) John, some time Marshal to the Admiralty at Gibraltar; and 3) Richard, of Nantyr, co. Denbigh, Recorder of Chester. Crest: A savage man Proper (natural color), cinctured and wreathed Vert (green), holding in both hands a club. Motto:..Me stante virebunt...(While I stand they will flourish); Tyme tryeth truth. Cf. the 4 entries for Tyrwhitt in Burke's "General Armory", pg.1042. Notes: Abbess of Ipswich after her husband death. Will dated 18 Feb 1476/7; proved 12 May 1477. Notes: Member of Parliament for Lincoln 1423. High Sheriff of York 1435. Notes: in Lincolnshire Pedigrees, referring to all the daughters, says "It is not certain whether these were the daus. of Sir William Skipwith by his 1st or by his 2nd wife". Notes: grantee of Cameringham and Stainfield, at which latter place he built the mansion bearing that name, long the residence of the Stainfield branch of the Tyrwhitts, its first baronets. This gentleman, High Sheriff of Lincolnshire; Knight of Kettleby; Knighted at Touraine 1513; Vice-admiral of England; and a banneret, was seneschal of the priory of Newstead, as also of Elsham, and bailiff of Barton on Humber, in 1535. Notes: "Lincolnshire Pedigrees" dau. of Edward Tyrwhit; remar. Edward Littlebury. Notes: near Brigg, Lincolnshire. Seneschal of the priory of Gaykewell, served the office of sheriff for Lincolnshire, 1535, and, with his brother Robert, was one of the ecclesiastical commissioners for that county, in the the same year. Sir William obtained large grants from the crown at the Dissolution of the monasteries. 1537 High Sheriff of Lincoln. Predeceased his father in 1541. Notes: MP for Huntingdon 1571, for Derby 1572, for Great Grimsby 1586/1589. Notes: Prebendary of Lincoln Cathedral 1545. Notes: for whom the Tyrwhitt´s of Scotter and Cameringham descended. Notes: Sheriff of Lincolnshire. His son Edmund was a gentleman pensioner to Charles I. Thomas was Devine and Chaplain to King Charles I; Fellow of St Johns, Cambridge and Proctor 1631; Rector of Thorington, Essex 1661. Francis, who in his youth cup bearer to the Queen of Bohemia, sister of Charles I. He accompanied her to her husbands Court, was present at most of the great battles of that period on the continent. In 1631, having the Kings Commission for that purpose he raised 1,500 men for the service of Gustavus Adolphus and in 1632, when on retirement of the Marquis of Hamilton from the command of Gustavus English and Scottish forces, his successor, the Duke of Saxe Welmar had reformed the 8,000 British into two regiments, Lieutenant- Colonel Francis Tyrwhitt, was by Gustavus' desire appointed to the command of the first. In Nov 1632, a few days before the battle of Lutzen, he was taken prisoner by the imperialists whilst on a reconnoitering party with Gustavus and thus debarred from sharing that fateful day. After the action. In 1642, he joined King Charles at York, with 155 men and in the same year was appointed to a principal command in the wars in Ireland where he died in 1643. Notes: nephew of Robert Tyrwhitt of Leighton, who had married another Elizabeth Oxenbridge, half sister of Thomas Oxenbridge (b. 1502 - d. 28 Mar 1540). Thomas and his wife, Elizabeth Puttenham (b. 1507 - d. 1529), were the parents of the second Elizabeth Oxenbridge, who married Robert Tyrwhitt of Kettelby. Sir Robert of Kettelby was also at court, and he raised and led 250 of his tenantry with the army sent against the rebel earls in 1569. Many accounts confuse these two sets of Robert and Elizabeth Tyrwhitts, or try to combine them into one couple instead of two. 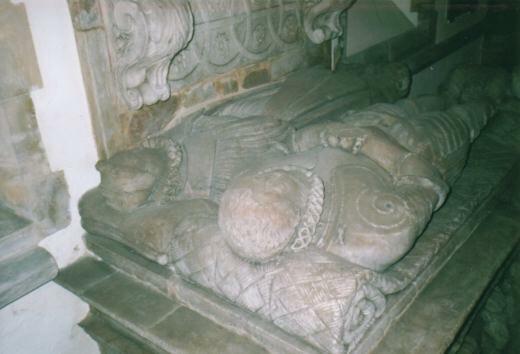 The Tyrwhitts of Kettleby, however, have the distinction of having produced twenty-two children, all of whom are pictured on their tomb in Bigby, Lincolnshire. 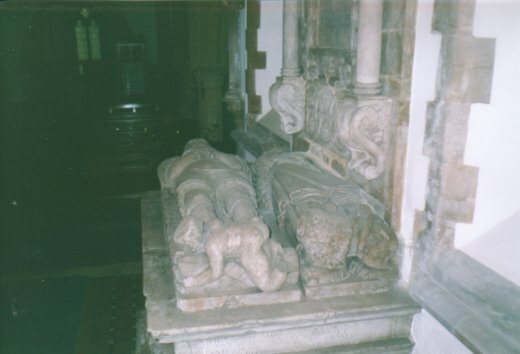 The monuments of Sir Robert Tyrwhitt of 1581 and his wife Elizabeth Oxenbridge are in Bigby church. 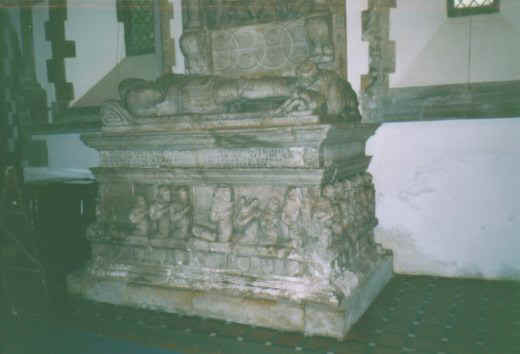 The twenty two children of Sir Robert and Elizabeth can be seen around the base of the monument, and what is described as a large hairy man can be clearly seen laid across Sir Robert's feet. 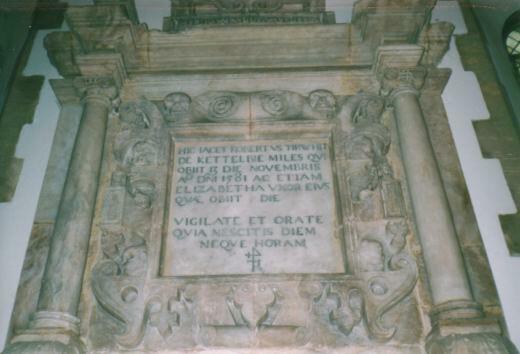 Elizabeth was buried on 25 Jan 1589/90. ¿2. Robert FITZWILLIAM of Mablethorpe? ¿Married: Henry CONSTABLE ABT 1602?